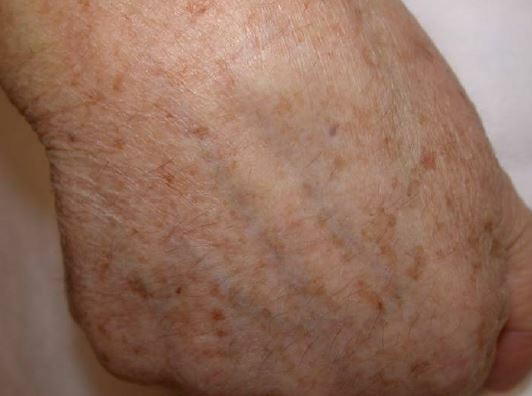 Skin discoloration may appear at different ages and concern both women and men. It is caused by both congenital factors, such as genetic conditions and those connected to our lifestyle and the influence of the environment. The natural skin pigment, melanin, is located in the skin, in melanocytes. 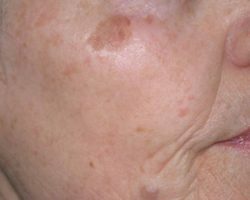 Their excessive amount may lead to color changes on the outer skin, which is seen in the form of spots and discoloration. Excessive production of melanin in melanocytes is called hyperpigmentation. Aesthetic medicine may help us remove discolorations, and the most recommended as well as the safest procedures are laser treatments. Excessive production of melanin may be associated with a variety of factors, such as: pregnancy, hormones, UV radiation, impact of copper, iron, gold and silver. 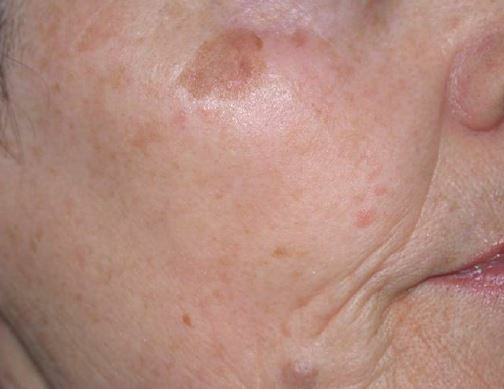 Discolorations not only appear on the outer layer of the skin, but they can also accumulate in epidermis, therefore light beams emitted by modern medical lasers ALMA IPL with DYE VL head are so effective in hyperpigmentation. 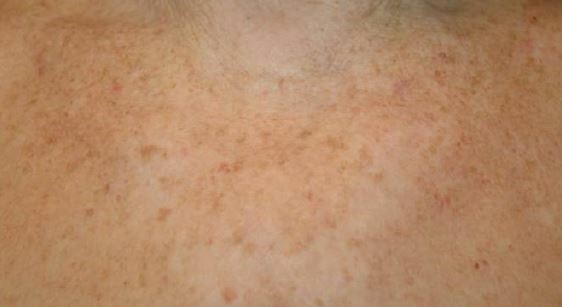 Riehl melanosis – skin spots appear due to reactions of the sunlight with inadequately selected cosmetics, as well as medicines, which may have photosensitizing effects (Saint John’s wort, some slimming medicines, pain killers, anti-inflammatory medications, drugs for cardiac arrhythmia and disinfecting the urinary tract). Light red or bluish discolorations appear, which may intensify with time. We can observe them on the face and necklines. 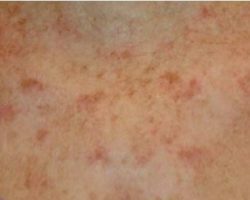 Solar lentigo (liver) spots – caused by external factors. 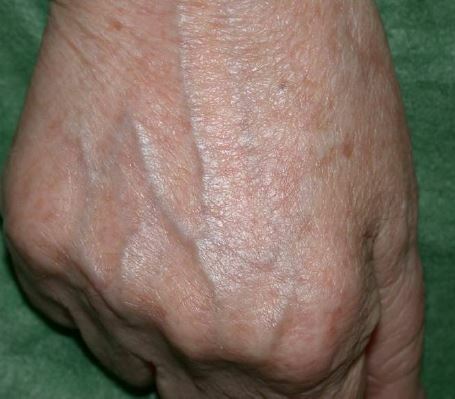 In elderly people we observe them on the outer side of the hand. They also appear on the face. They are caused by multiplication of melanin in cells. They form small, less than one-centimeter spots. They are caused by long-term radiation, as well as impact of other pathological changes, including acne. 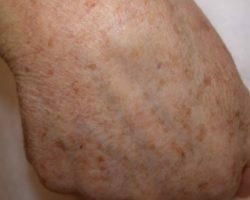 Chloasmas – are discolorations characteristic of women, related to hyperactivity of hormones and increased production of melanin in the epidermis. They often accompany pregnancy, hormonal therapy and taking of contraception pills. We usually observe them around the nose, cheeks, forehead, lips and jaw. 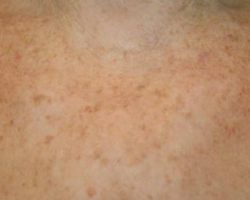 Freckles – the most common discoloration, connected with the amount of melanin in the epidermis.. They are often caused by hypotrophy of pigment cells, usually in places that are most often exposed to the sun. They usually occur to people with bright skin color and red hair, thus they are congenital. They may intensively occur in the periods of high exposure to sunlight or after using sunbeds. They are more visible in the summer and pale in the winter. They may be located on the face, arms, neck, neckline, hands and even knees. Effective discoloration treatment depends on the type and intensity of changes. It can be in the form of a one-off treatment, repeated once a year, as well as a constant element of therapy and care. Every patient is subject to individual assessment and the best treatment plan is selected to their needs. In the aesthetic medicine centre in Warsaw we use the world-wide recommended IPL laser with DYE – VL head to remove discolorations. It is an intelligent and safe laser which recognizes accumulation of melanin in the epidermis and on the basis of that, it selects appropriate light beams. DYE – VL laser has a three-filter technology, thanks to which the flow of energy is selective, i.e. only to the changed cells, avoiding the healthy ones. A patient feels comfortable and safe, since their comfort during the treatment is catered for by a special cooling technology installed in the laser head. 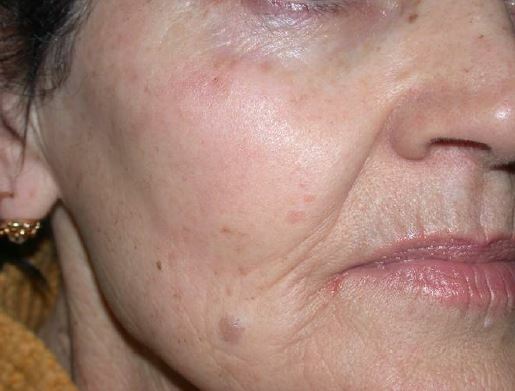 We can notice the best results of laser discolorations removal in the vases of shallow changes, such as: freckles, tattoos, chloasmas, liver spots, discoloration of seborrheic keratoses, spots after anxiety treatments. 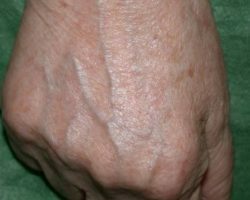 The longer the discolorations remain on the skin, the harder they are to be removed and may require a longer therapy time. In order to become familiar with our offer regarding tattoo removal visit our website where you will find all necessary information regarding the removal of this type of discoloration. Before the laser discoloration removal, clients are recommended to consult our specialist in order to select the best treatment plan. In the case of permanent changes, it may be recommended to conduct another initial treatment to make the laser treatment effective. 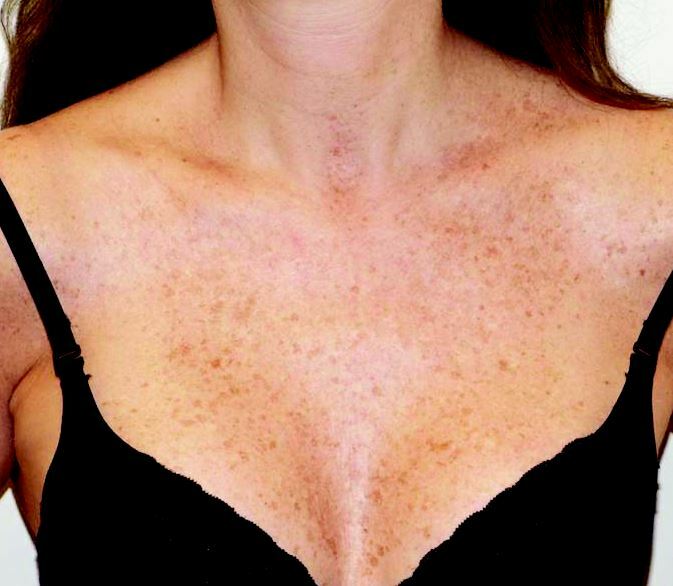 It is crucial to remember to avoid natural tanning and sunbeds 4 weeks before the planned laser skin lesions removal. In this time we should use high sunscreen factors, avoid alcohol, photosensitizing medicines and resign from cosmetics that dry the skin out, containing alcohol and those perfumed. During the procedure, a patient’s face is thoroughly cleansed and protected. A special gel is applied to selected skin areas, and a specialist physician by applying the head to the skin emits light beams of 500-600nm. There is no need to use local anesthesia, since the procedure is painless. A patient feels heat, which is neutralized by laser cooling systems. Some patients may feel slight stinging or burning, both during and a few days after the treatments. The Alma Dye VL laser treatment is pleasant and does not require sick leave. After the discoloration removal procedure, patients may quickly return to their normal everyday activities. It is recommended to use high SPF during the treatment, avoid sun exposure, artificial tanning, hot baths, cosmetics that irritate the skin and dermatological treatments of the treated areas. Some side effects may occur, such as burning, itching, swelling, becoming blue, change of the color of discolorations – to alleviate the symptoms, it is recommended to use cooling ointments or medicines, anti-allergic makeup. 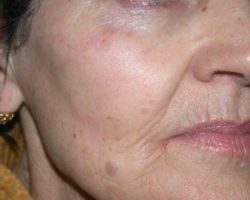 Depending on the type and intensity of changes, a laser discoloration removal procedure should be repeated 3-5 times at monthly intervals. During the therapy, a patient’s skin is gently exfoliated. It is a natural process and deep peels of the skin should not be used in this time. Say GOODBYE to the troublesome skin discoloration and changes. 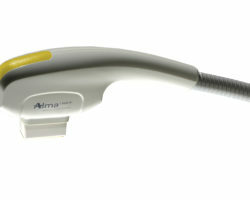 Laser therapy with ALMA Dye VL is effective, permanent and safe. You will get rid of embarrassing skin defects quickly and without complications.